After our confidence building romp over Columbus, Ranger fans needed good effort against recent conquerers Florida, to prove the 7 goals scored against columbus was more than the customary post mortem twitch we have grown used to after many a slide we've witnessed over the years. The team heard our cries, at least for one night. Official Recap Here. Henrik Lundqvist and Panther Goalie, Thomas Vokoun, reprised their roles from the last game between the teams, stopping most everything that came within feet of their respective goals. Its the rest of the team that provided the difference from the last game. Our skaters were aggressive play on both sides of the puck. For 60 minutes, the team hardly made a mistake and took the game to their opponents; battling along the boards, standing up for their goaltender and each other. Matt Gilroy dropped the gloves (well Sort of) and saw his first fight in the NHL after taking the action to larger Victor Oreskovich who had just flattened his unsuspecting alternate captain, Vinny prospal. While the fight was kind of one sided, and Gilroy earned 17 minutes in penalties (including a mystery 10 minute misconduct that still wasn't given any explanation)which saw him gone for most of the 3rd period, it was generally agreed that his actions were justified even if his team was already down a defenseman after losing Redden to injury in the first. 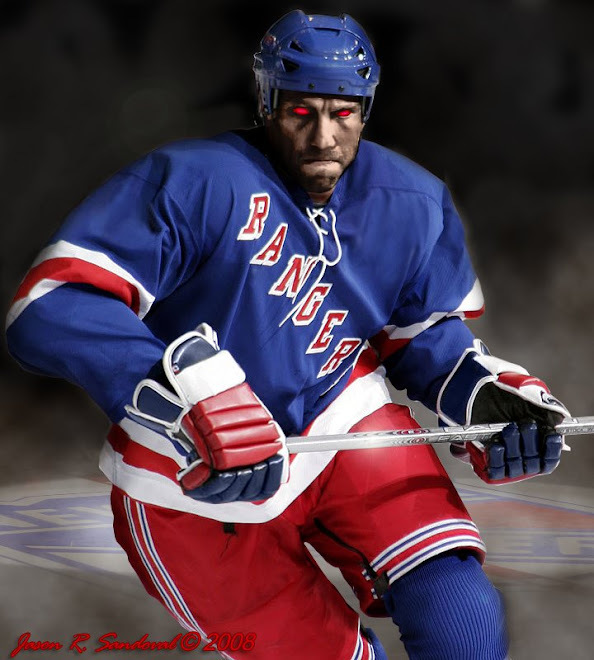 It wasn't just Gilroy, Marc Staal seemed to up the intensity of his game as well. In fact it seemed to be a trend among the team. The team played aggressively and with authority, even though they were battling a cat team that was looking to capitalize on mistakes and oddman rush opportunities. They got some extra help from our returning captain. Fresh off the injured list, Chris Drury would pick up the primary assist on the only regulation goal by the Rangers and test himself early by throwing some checks. One goal and the stellar goaltending would be enough to carry the Rangers into the shootout despite being down 2 (Redden, Gilroy) defensemen early into the 3rd. PA Parenteau was once again the hero for the Rangers in shootout. Coach Torts definitely seemed relieved for the team to carry their win streak to two as he could be seen beaming from the bench as the team headed into the lockeroon after the final buzzer. I've got to say, this is the kind of effort we have been waiting for ever since we've been on the skids after the first 8 games. The defensemen took the body, the offensive guys played with heart. The players stuck up for one another. The team took another step toward firing on all cylinders. Our secondary scoring wasn't there as much as in the last game, the sean avery factor is still not at full volume yet and right now Voros seems to have more interest in playing the team tough guy than Brashear. While all those things may be true, after 2 wins, its clear that we once again have something to lose.